Dimensions: 7 cm across when slightly flattened. 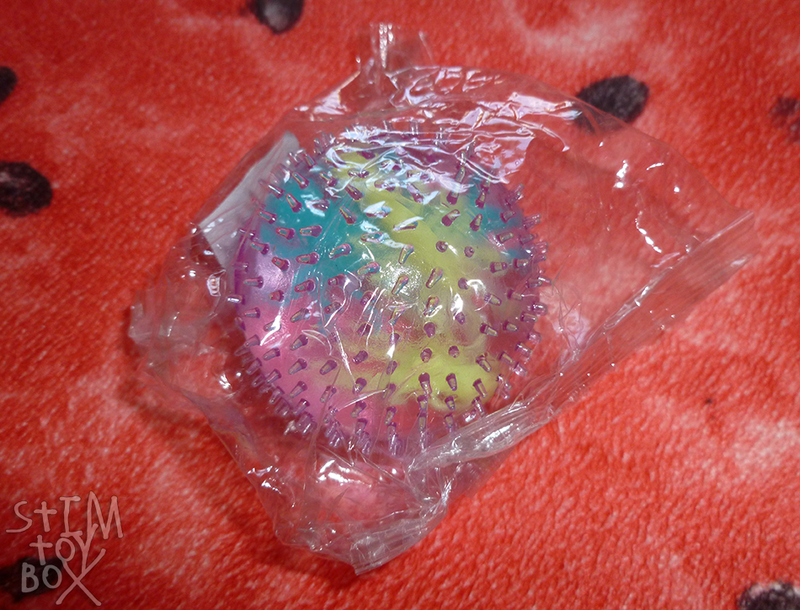 On paper, this should be an amazing toy: it’s a liquid-filled squishy with soft spikes on the outside, like a puffer ball, and hard plastic toy insects inside the ball. I can roll the ball in my hands for texture and poke a finger inside the ball to touch the coloured insects through the skin of the ball, providing more textured things to grab and stroke. I can also squish down on this like a balloon stress ball or puffer ball, causing the ball to bulge on the sides, and pull on the fronds like a puffer ball. And, for all of those things, this ball is amazing. For a fantastic design mingling multiple forms of stimming and sensory options, I give it all the points. So why do I have this ball remaining inside its plastic bag, as far away from my desk as I can get it while still remaining in my room? Smell. I don’t mean the usual plastic puffer ball smell, which I find abhorrent as is but consider a fair risk when buying these. I’m not sure what this smells like–chemical plastic crossed with ammonia? It’s bad. It lingers on my hands for a long time after handling and I can’t wash it away with ordinary hand soap. I’m going to put it outside to see if I can air it, but I’m not hopeful. If you don’t have any difficulty with chemical odours and you really like the sensory possibilities in this kind of puffer ball/jelly squishy hybrid, you may wish to take a risk on it. Otherwise? I can’t recommend it. Originally posted on @stimtoybox on November 22, 2018.